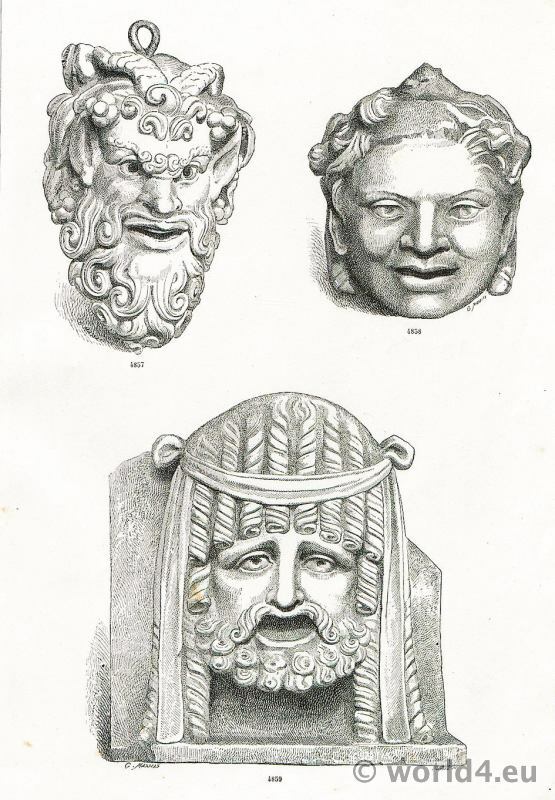 Ancient Theatre Masks. 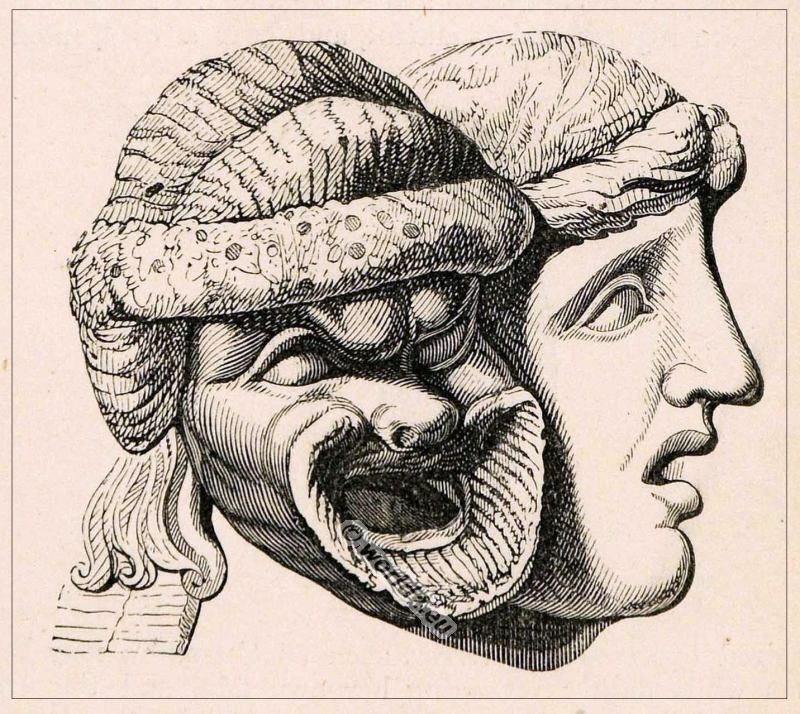 The masks of Tragedy and Comedy. Home » Ancient Theatre Masks. The masks of Tragedy and Comedy. 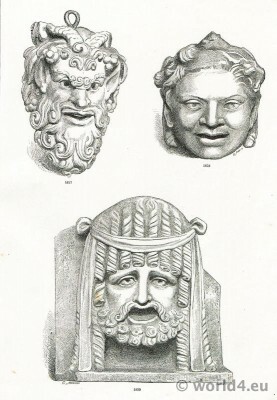 Roman Theatre Masks. 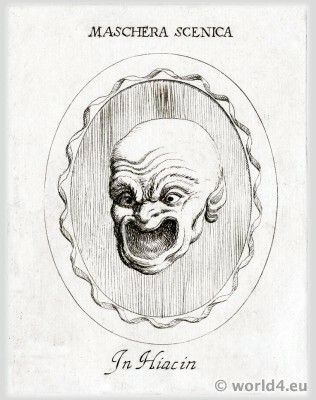 Tragic and grotesque Mask. 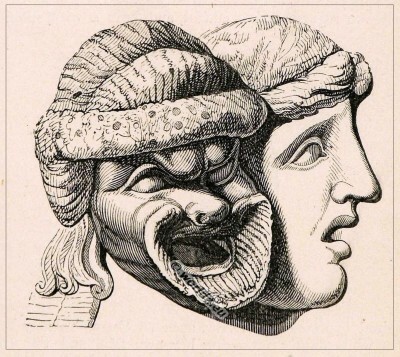 A hallmark of the tragic and grotesque theater in ancient Rome were the colorful and expressive masks (caricature). They accompanied the Roman theater play as a heroic choir, using songs, lively gestures, songs and movements. They were taken from Greece and reflected in the grotesque mask, the irreverent satyrs of ancient Greek cult of Bacchus, again. In return, the tragic mask was assigned to the fauns in its subtle beauty. The masks were elaborately worked metal and designed so that they as a sounding the tone of the actors reinforced. This type of Roman masks was widespread and was often found during excavations. Above: Satyrs Theatrical performing masks from Pompeii. Ancient Art Greco Roman style. Antiquité Art Gréco Romain de Pompéi. Masques Scéniques en Marble Blanc et tête de Satyre. Above: From the book Le gemme antiche figurate di Leonardo Agostini Senese, by Leonardo Agostini, published by Giacomo Dragondelli, Rome, 1657. Discoveries from the Augustus ruins of great Rome. Related: Ancient Roman Costume History in Europe B.C. 53 to A.D. 450. This entry was posted in Ancient, Ancient Greece, Roman and tagged Mask, Theatre on 8/27/13 by world4.